Over the years I have tried a lot of different nutritional supplements to see if they worked for me. For example I used to get painful muscle cramps in my legs during my sleep. It was suggested that I increase my daily intake of Magnesium and that took care of the issue right away. I would take protein powders mainly in the Whey and Casein form for recovery and rebuilding muscle after hard workouts and races. I felt it was helpful, especially the Casein protein powder I would take before sleep. This form of protein power digests slower than Whey protein so it is bio-available during the sleep cycle when the majority of muscle rebuilding occurs. But I didn't like the extra calories, the slight stomach upset of drinking it so late in the evening or the concern that protein powders can tax the kidneys/liver. Then I heard about a product called PerfectAmino which is a special formulation of the 8 essential Amino Acids that has an eye-popping 99% Amino Acid Utilization (most protein powders and supplements only average 16% body utilization and most dietary food proteins average 32%) I've been using this supplement for over 8 months now and have been recommending it to my running group and other endurance athletes. As mentioned I have tried a lot of different supplements but usually can't tell much if any difference in performance or recovery. But with PerfectAmino my recovery after big workout/race days has improved considerably and a hamstring issue that plagued me all last year cleared up in the first month of use. I've been doing a lot of high mileage in the spring of 2017 leading up to a 50 mile and a 63 mile ultra race. Peak mileage weeks were in the 90 to 100 mile range and I ran a 37 mile Saturday run and followed it up with a brisk 16 miler up/down Blackstar Canyon the next day without soreness. 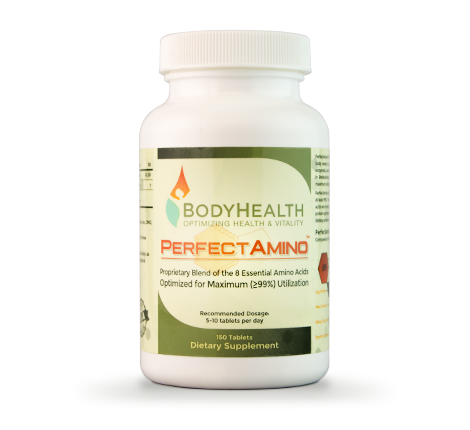 I also find an increase in energy levels by taking PerfectAmino before my workouts. Generally I take 5 to 8 tablets in the morning and then another dose after moderate or heavy exercise. It is also avail in powder form for those who don't like taking pills.. PerfectAminoXP - Drink Powder. I've stopped taking Protein Powders and rely solely on PerfectAmino to supplement my dietary protein intake. If you are looking for better recovery I highly recommend you try out PerfectAmino.